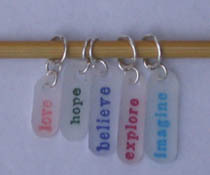 A few weeks ago, I mentioned on the Joss’d podcast that I had something new in the works for WearWithStyle that I hadn’t shown yet – Firefly stitch markers. Well, here they are! These are displayed on a size 5 needle. 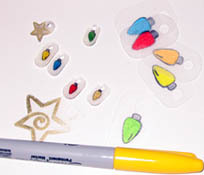 I can vary the size of the jump rings to fit different sized needles. 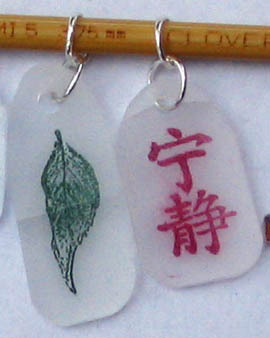 The materials are ink on clear plastic, with silver. I’m still experimenting with what looks best and which designs I want to include. However, I’ve worked out some kinks, like the neatest way to round the corners and which sealer looks and works the best. You don’t want your stitch marker to smudge, after all. The sets pictured are beta, combining sealers and techniques as I learn. And what did I learn today? 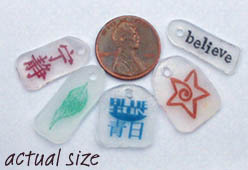 When you spray acrylic sealer on Shrinky Dinks in 45 degree weather, they crack. But not right away, when you’d notice, no they wait to crack until you’ve walked back into the house and are merrily working on more, unaware that it’s pointless to continue. The ones from the set that I did today, I consider useless. Pressing on the crack in the leaf caused it to break almost in half. Bleah. Well, live and learn. I’m doing other sets besides Firefly. For instance, I like the inspirational set at left. 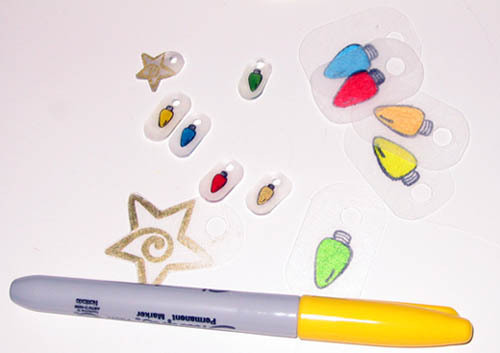 And there are some cute Christmas ones, pictured at right before and after shrinking. 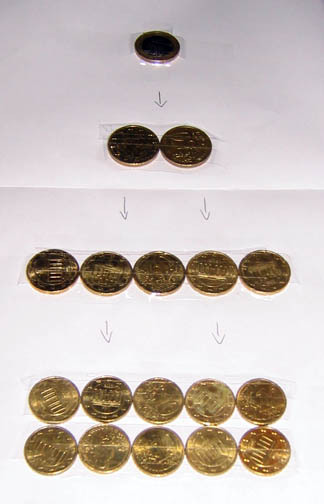 Unfortunately, after they were put out to be sealed, they cracked, as you can see in this picture. Le sigh. Aaaaanywho, that’s what’s going on in the non-knitting crafting world over here. In knitting news, Emily’s doll has its head and one leg completed. Jayne hats continue. Two more kits are ready to go out today. And that’s my day! ETA:Bears. Beets. Battlestar Galactica. The Office fans among you will get this. The prank referenced is about 7:20 in. Unfortunately, I don’t get Sci-Fi, so I don’t watch Battlestar Galactica, so I have to rely upon my memories of the old show, which I didn’t really watch. That graphic’s probably pretty weak. What else could I do to represent Battlestar Galactica? So the one be-all end-all toy that my daughter wants for Christmas is a Ty Girl. Actually, she wants two Ty Girlz (yes, with a Z) so that they can play with each other. She talks about it daily. I think the main thing about these is that they come with a code she can redeem on the Ty Girlz website. She loves toy websites and this one looks like a doozy. Now, on a skankiness scale of 1-10, with 1 being Raggedy Ann and 10 being Bratz, I think these clock in at about an 8. I think they wear too much makeup, look too grownup, have heels that are too high, and wear clothes that are too adult for an eight-year-old girl to play with. Some dolls are better than others. In looking for pics, they look more respectable online than they do when I see them hanging from the display rack at the toy store, for some reason. Lately, I’ve been trying to not underestimate Emily. Interacting with kids is like hitting a moving target. By the time you get used to them at their current age, they’ve moved along and you’re treating them like they’re younger than they are. So when Emily asked me what my favorite thing about Ty Girlz was, rather than give Emily a non-committal answer or agreeing that they’re awesome, I told her that I didn’t really like the Ty Girlz. She asked me what I didn’t like about them, and I mentioned their high heels, and that I thought they wore too much makeup. I had no idea what to expect in response to this. She handled it with good grace, standing her ground but not getting upset. “I really like them. I don’t think they wear too much makeup. I like their pretty hair.” Good girl! I may question your taste, but I’m proud of you for not buckling! I also allowed that their hair was, indeed, pretty. Periodically since then, she’s said, “I don’t think they wear too much makeup.” She’s still angling for a Ty Girl or two. I think she’s decided Santa’s her best shot. I’m undecided as to what to recommend to Santa. But I like that our conversations can be more complex now. Speaking of orange, remember those two huge 4 pound cones I got in October? I’m down to about half of one cone. It’s going fast this time of year. I ordered more a few weeks ago, but God knows when that’ll come in. Brown Sheep, curse your sudden but inevitable betrayal! On a completely unrelated note, my lymph nodes are all swollen up. Well, not ALL swollen up, but definitely more so than usual. I don’t seem to be running a fever, and I feel fine, soo… go figure. I’ve had this happen mysteriously before, and it worried the doctor, who ran all kinds of tests and freaked me way the hell out, and then they just kind of… mysteriously went back down again. I suppose I shouldn’t be complacent, but I guess my body just periodically conducts some kind of systems test. I have no clue why. If this were a TV drama, you’d be reading this post while sad music played behind you, dressed in nice clothes because you’d just come from my funeral, shaking your head at the injustice of it all. “If only she’d known,” you’d say. Well, enough of that. 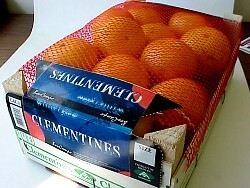 I have hats to knit and Clementines to eat. Also, Emily’s surfing the Camp GroovyGirls website, and she wants me to play with her. Across the Pacific was okay. It was a mish-mosh of various Bogey movies thrown together. The tough as nails character named Rick, the obese villain by Sydney Greenstreet, etc. It was good, but man, it was a product of its times. The Japanese do not come off well in this. I had to keep reminding myself that this was made in wartime. So when the female lead makes a point of saying that if you look really closely, they don’t all look alike, I didn’t roll my eyes completely out of my head. Only partly. Then there was the coke-bottle glasses super-Americanized character, who of course turned out to be Evil with a capital E in the end. Well, I guess that’ll put you more at ease with the then-current internment camp policy. Of course, since the Japanese were considered a security threat, many of the Asian characters were played by Chinese actors. Interesting side note, apparently this was originally written about plans to bomb Pearl Harbor, not the Panama Canal. Then the Japanese actually DID bomb Pearl Harbor. One of the principals involved in the picture described it as “creepy” which is surely understating things. However, social issues aside, this was good but not a classic. All the elements were there, but it wasn’t a classic. 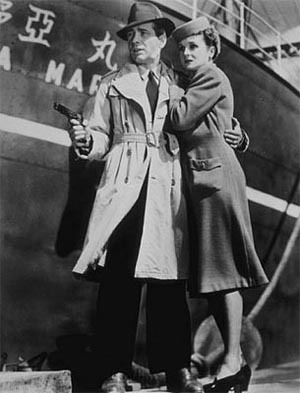 For better bang for your buck, go rent Casablanca and The Maltese Falcon and make a night of it. Shipped out two kits and a hat yesterday. Today, I need to pack up two more kits and finish up the second blue Jayne hat. This one fits much better. Now I’m contemplating ripping out the old one and casting on four fewer stitches. I’d rather redo it than send it out loose. Darn my craftsman’s pride! 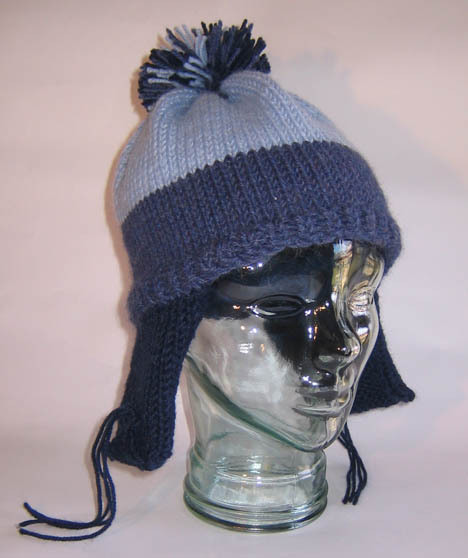 As of this morning, the Jayne hat line is up to nine weeks and could go up to ten at any moment. Someone ordering now might not get their Jayne hat until February. Yowch. I’ll give you one guess as to what I’ll be doing this morning. 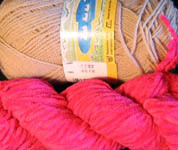 Hint: it involves yarn. And while we’re on the subject of Jayne hats, check out this fantastic package I got from a Browncoat in Germany! 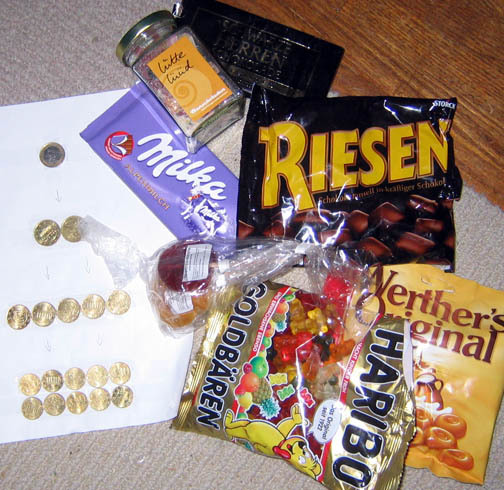 When placing his order, he asked if there was anything from Germany I might like to have. 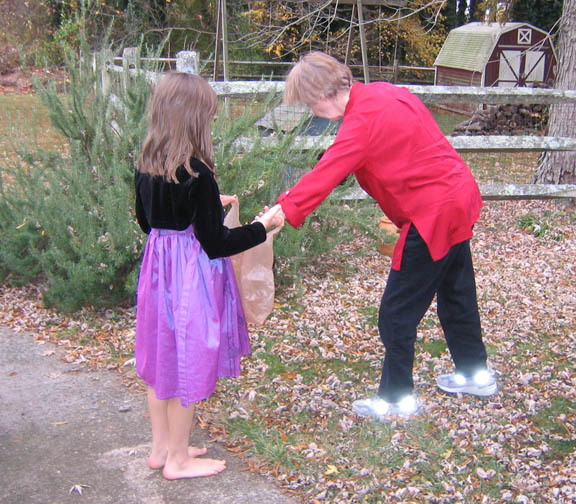 I of course mentioned currency, and that if he wanted to put anything else in, my daughter loved candy. This was truly above and beyond! 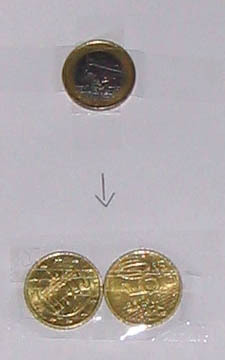 He even arranged the Euros so that it was easy to tell the different denominations at a glance. I swear, Browncoats are the best people. I told him we didn’t need to worry about payment, this was payment enough. As if this weren’t enough, he’s also sending a second package with a bottle of beer for my husband. My husband, in return, is bottling up his current offering, so we can send him an American Pale Ale. I’m sure he’s familiar with the type, but my husband is feeling very good about this particular brew. I tell you, nice guys abound in my life. By the way, many thanks to everyone who’s donated currency so far. Rupees, Bahamian quarters, yen, shillings… this stuff is super cool. Today I’ll be taking pics of each individual set that I’ve gotten so I will remember who gets what back when it’s all over. Okay, I’m hitting the grocery store, then watching Across the Pacific with Humphrey Bogart. Based on this 1943 review, I expect great things. Needless to say, I’ll also be knitting like the wind! Woo! It’s a cool, overcast morning. Moments ago, I picked up my laundry basket to hang the clothes out to dry. As I came through the back door, a large deer with a full rack went slowly bounding out of our fenced back yard to the edge of the woods and turned to casually look at me. Now that’s the way to start the day. I don’t remember who it was who asked what my eBay identity was, but it’s Emisanboo. I’m going to try to put up something new every day to keep stuff slowly flowing out of here. Today was a couple of books I picked up on a high school trip to New York, tomorrow will probably be a bunch of beading magazines. Pyongyang: A Journey in North Korea by Guy DeLisle. Yeah, that Jayne hat’s not looking so silly now, is it? Man, that cracks me up. I might have to knit me one o’ them. 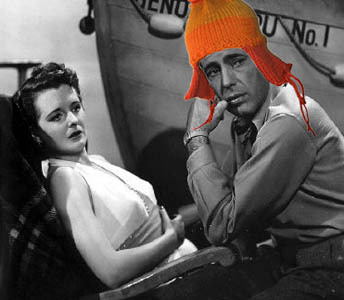 Speaking of Jayne hats, here’s the first of several non-orange Jayne hats. The color is a bit richer than the picture indicates. The person who commissioned these was concerned about the Lamb’s Pride itchiness, so I’m subbing Berroco Ultra Alpaca doubled. It knits up at 4 stitches to the inch on size 9 needles. It’s a little dense, but any bigger of a needle and it’s too loose, so I’ll stick with this. I’m a little concerned – by my calculations, this is 22 inches around and it’s for a 24 inch head. Is that enough negative ease? I worry about little things, and I always get nervous when they feel loose anyway. Of course it’s supposed to be loose on me, I don’t have a 24 inch head, but I still get nervous. The next one’ll be for a head 23 inches in circumference, and maybe I’ll snug it up a bit more. In my experience, people tend to measure their heads a little big. Emily picked out the yarn for her doll. The body will be the same color as the others, but she felt compelled to choose the hair from among the colors at the yarn shop… so hot pink it is! I have a few more red options here at home which I will present to her, but I know from experience that once she’s picked something, she’s set on it. And that’s fine. It’s her doll, and if she wants it to have hot pink hair, then it will have hot pink hair. 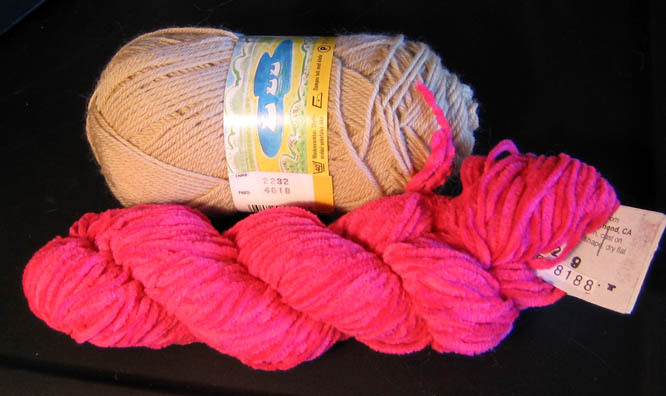 I’m off in a few minutes to hit the post office to mail some Turino silk, then another yarn shop looking for a good green in Ultra Alpaca – with a stop at a coffeeshop along the way for a pick-me-up. Thanksgiving left me beat! A Thanksgiving classic. It kills me every time. Thanks for the link, Dad. 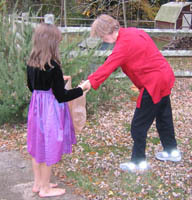 Also, Mom stopped by, and I sent Emily out to look for leaves for the centerpiece with her. A task that used to be mine, that I’ve now foisted off passed on to my daughter. As you can see, Emily decided to dress for the holiday. At 9am this morning. Heh. This morning, I was awakened by my daughter coming into my room and telling me, “Today, you need to start knitting me a new doll. This doll will have green eyes and red hair. 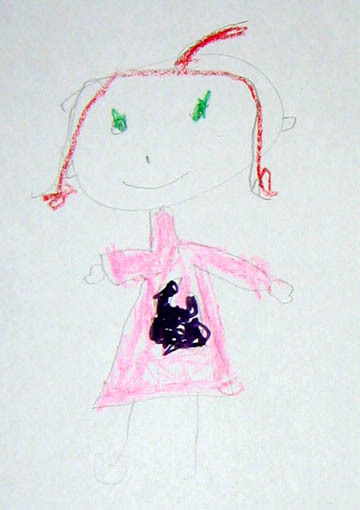 And a pink dress… with a heart… that says “Elizabeth.” Note artist’s rendition to the right. This child couldn’t say the words “yes” and “no” at age 2 1/2. So even though this is an utterly outrageous request, I’m very thankful for it. Do you have something in your life which might seem to be a negative that is actually something to be grateful for?